It seems like Aquaman will delve into Arthur Curry’s past. A surprising Handmaid’s Tale return is confirmed. There’s more to deaths in the aftermath of Arrow’s explosive season finale. Plus, new pictures from The Lego Ninjago Movie, and Peter Capaldi and Pearl Mackie on Doctor Who’s season finale. Spoilers now! Producer Lorenzo Di Bonaventura told Screen Rant filming begins in August. Well we’re going to shoot a prequel actually, a Bumblebee movie, which starts in August, so next summer we’ll see a Bumblebee movie. 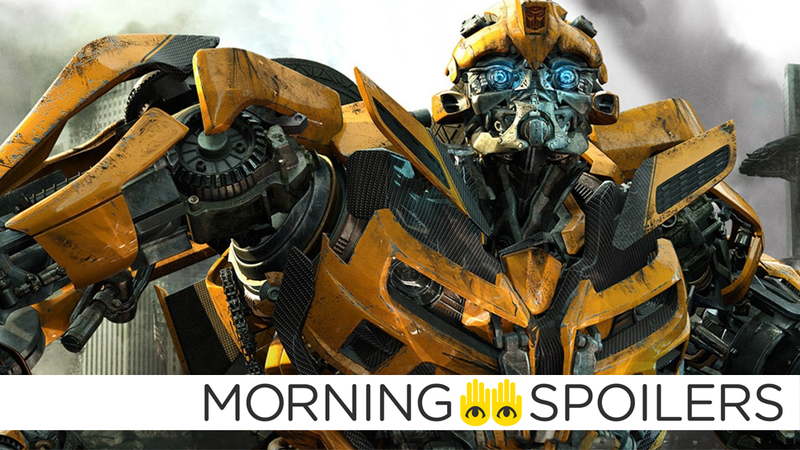 And then we hope to have another Transformers movie the following summer. Look, I always wait for the audience, because there’s an arrogance to getting ahead of your audience. When you do, you get punched. So we’ll wait each time. We’re planning a lot of movies, but you’ve got to have the audience’s support, because these movies are very expensive. In a separate interview with Comic Book, Bonaventura stated the film may finally embrace the original, boxier Transformers designs of the earlier generations—although odds are, the film will simply use ‘80s cars in its already established aesthetics, so don’t get your hopes too high. That we haven’t done? Oh, I don’t know. You know I am looking forward to in the Bumblebee movie reliving the eighties Transformers and what those kind of cars can look like, so I think that’s really fun. Deadline reports that Michael Beach has officially joined the cast as Jesse Kane, a pirate who runs afoul of Aquaman. The production has also cast its nine-year old version of Arthur Curry. Neve Campbell has joined the cast of Legendary’s 21st Century take on the Towering Inferno—starring Dwayne “The Rock” Johnson, naturally. Scott Derrickson stopped by the Sanctum Sanctorum in a new set photo from the Russos. Coming Soon has exclusive pictures from the movie. Head over there to see more. Alexis Bledel’s Ofglen has been promoted to series regular, making it at least seem like she survived her incarceration at the end of season 1. Grahame McTavish promises no one will die a boring death in season two. The way that people die in Preacher — it’s not just sort of boring, conventional ways people would die normally in a show. It’s quite creative, and my character particularly finds interesting ways to deal with people with his various weapons and his bare hands. A lot of the discussion that we’ve had and a lot of the discussion we’ve seen online is very binary — people either live or they’ll die. There are other consequences that can come out of what happened at the end of [episode] 523. While everyone is focused on one thing, you know us on Arrow, we may be doing something else. Mitch meets his estranged daughter, Clementine, in the synopsis for episode 2 of season three, “Diaspora”. Peter Capaldi and Pearl Mackie introduce this week’s episode, “World Enough and Time”. Finally, now you can imagine what yesterday’s poster looked like if Nirvana played in the background and it was in fact several photos animated together.